[Matt] No newcomer to the running market, Brooks always puts together a comfortable, well-made winter setup. 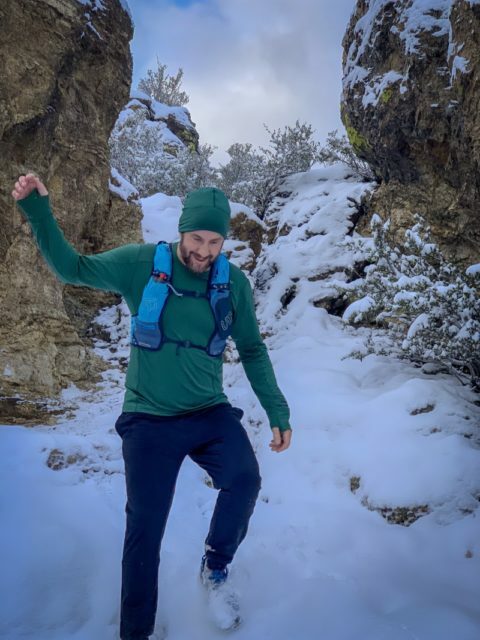 The Steady Long Sleeve tech tee is pretty standard and probably the most basic thing in the bunch, but fits well and features thumbholes for extra comfort and warmth. The beanie is soft and comfortable and is deeper than most beanies, so it will fit even larger heads. The mittens look great and are moderately warm. They offer wind protection but are not waterproof, so don’t count on them if conditions are super wet. 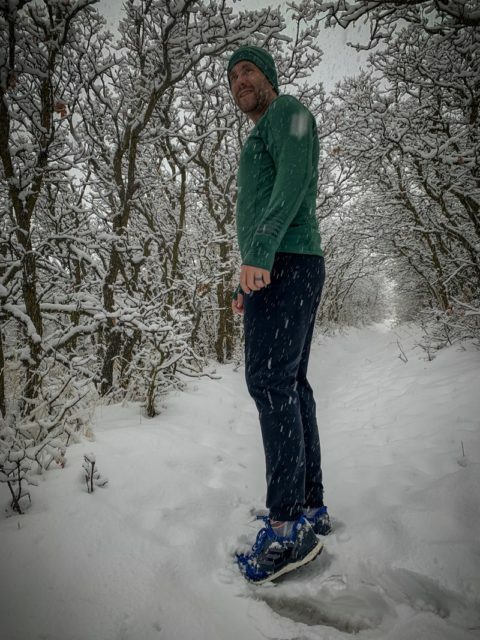 The Brooks Notch Thermal Long Sleeve is incredibly soft, warm and comfortable. I found myself shedding my jacket in several instances as this (along with a base layer) was plenty to keep me warm. This wicks moisture well and also has thumb holes for added comfort. It also looks great and would be fine to wear out and about. The Threshold Pants are a more typical loose pant style as opposed to a winter tight. 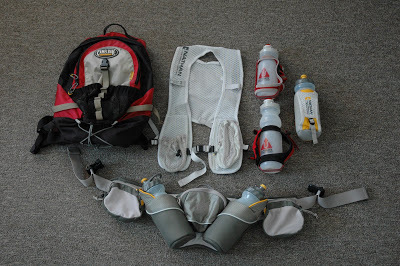 They have zipper pockets on both sides, so you can stash stuff on your run, and you have a place for your phone and wallet when you go for your post-run coffee. Be sure to keep them zipped so you don’t lose your stuff, and to keep you from sporting the ‘umpa loompa’ look – when left unzipped the pockets flare out at the hip. Pants are warm but will hold water and get heavy in wet conditions, so cold and dry is best for these. While I generally prefer tights, these are a great choice if you like a standard pant-like look. 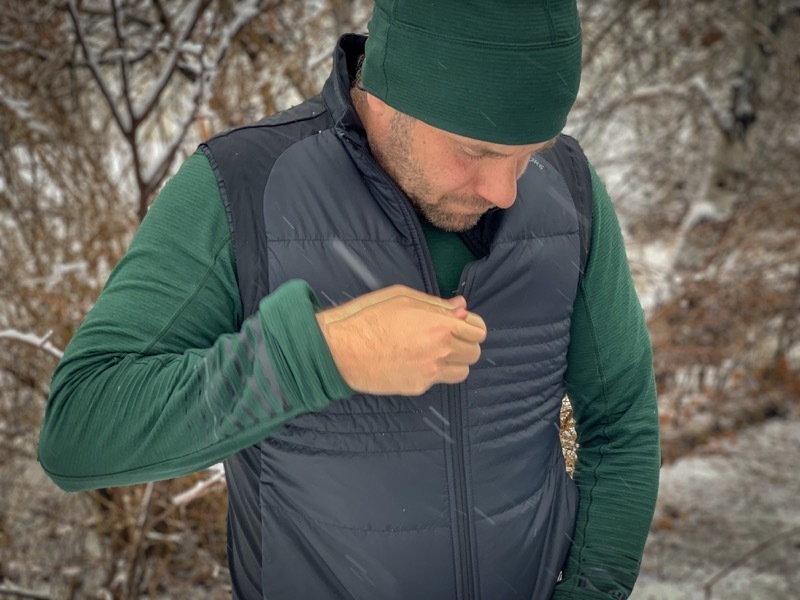 The Cascadia Thermal Vest is a really great extra layer if you’re going to be in extremely cold conditions, or need a nice dry layer after a run. 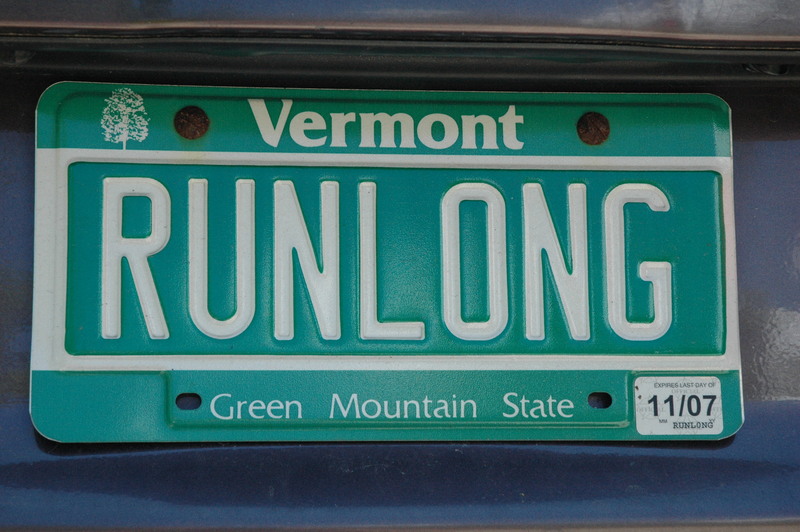 I generally found it to be too warm on a run, but have worn it nearly every day either after a run or around town. It looks great, is warm, and doesn’t add a lot of bulk. 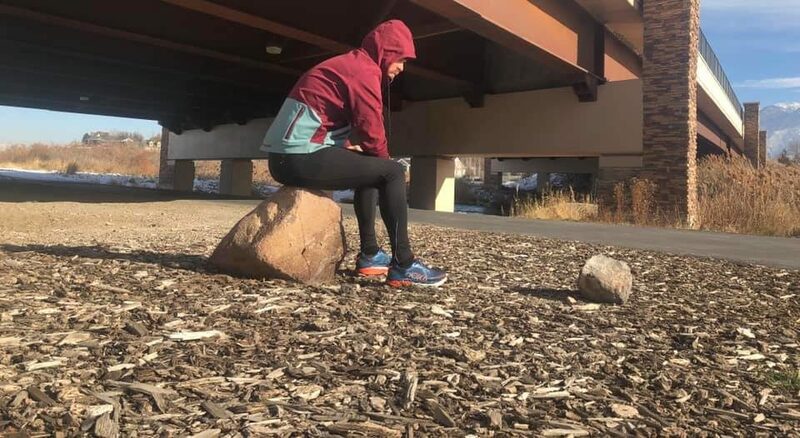 [Brent] The Pearl Izumi Versa soft shell hoodie performs wonderfully. Pearl Izumi went all out on functionality, fit, fabric and comfort and gave us pockets! I loved this jacket because it allows for stuffing gear in the two large front pockets while giving you options on the front right with a small welded zipper compartment for keys, gels or a smaller phone compared to the behemoth I carry. There is also a zippered rear access pocket to toss in a cap or gloves. The fabric is a perfect weight inner brushed soft shell and does great in the cold. I used this jacket on multiple days in sub-freezing temperatures with two of those days being 14 and 22 degrees. I retain heat well and kept me comfortable even in that cold environment. I’m almost afraid it would be too hot in anything over 30 degrees. At the cuff at the wrist, there is a great inner liner that gives a nice little squeeze at the bottom so the weather doesn’t travel up the sleeve. Be it wind, rain or snow it’s not making it way up the sleeve. I used this jacket in snowy conditions on a couple of occasions and fell a couple of times in knee deep snow the frozen fluffy water never made it past the cuff. Brilliant. The fit on this jacket has a great cut and fits lean and athletic. It’s long enough to cover past the waistline but not too long where it feels like you are swimming in it. It also functions great as a casual around-the-town jacket or to work. [Craig & Emily] The Peal Izumi Versa Quilted Hoodie is a mix of soft-shell fabric and Primaloft Gold insulation to keep you warm in colder temperatures. This jacket is specifically designed to help you manage varying temps, regardless of the activity you’re engaged in. Whether out hiking or mountain biking, this jacket is perfect when the temps dip well below your normal comfort level. Our experience with the Versa Quilted Hoodie has been amazing. From day 1 it has become our go-to everyday jacket. It has an uncanny ability to not let you overheat when you’re wearing it in the house or office. But when you step outside into sub-freezing temps it still keeps you warm. We couldn’t tell you how Pearl pulls this off, but they have done with clinical perfection. We can say with full honesty that there has been no other article of clothing we have ever owned that has received so many compliments. Both of us get daily comments from friends and strangers alike about how good this jacket looks. 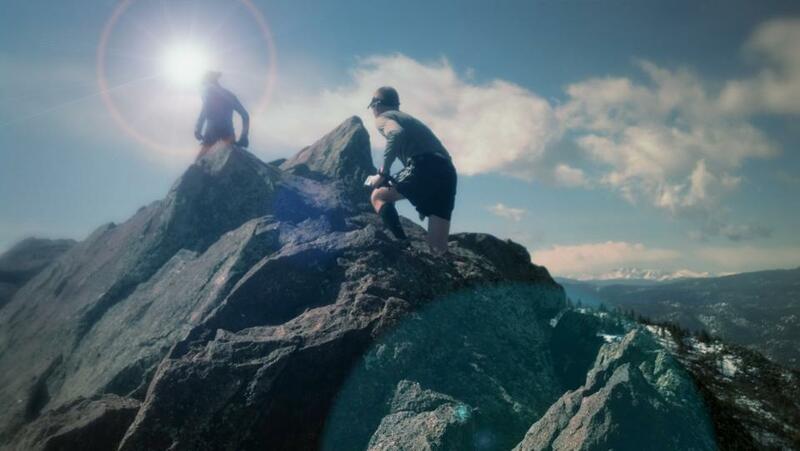 If they only knew how well it performed, Pearl Izumi would never be able to keep them in stock. The jacket is simply incredible! The wool set is part of Bjørn Dæhlie’s base layer line and contains netting for breathability and moisture wicking purposes. 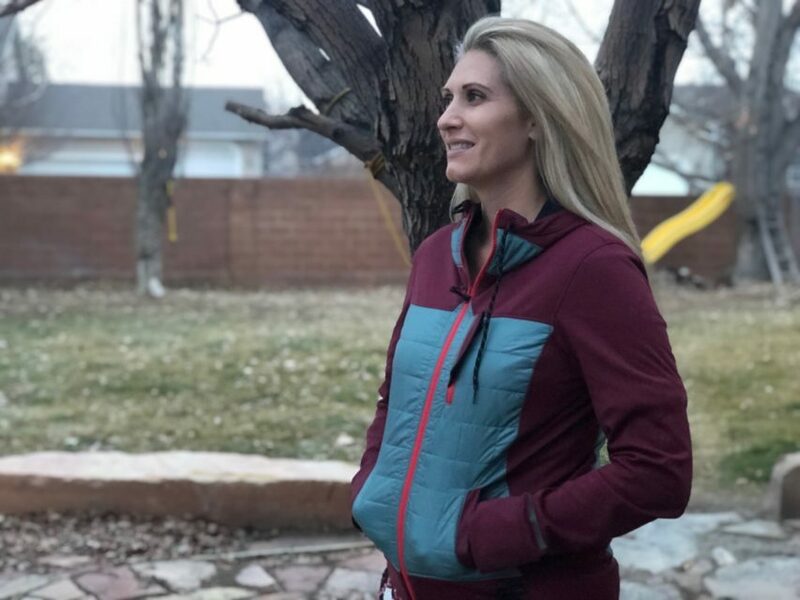 The Spectrum 3.0 Jacket is a lightweight and technical/water resistant jacket that has underarm mesh to aid in ventilation, as well as a tapered cut to better fit a woman’s body. 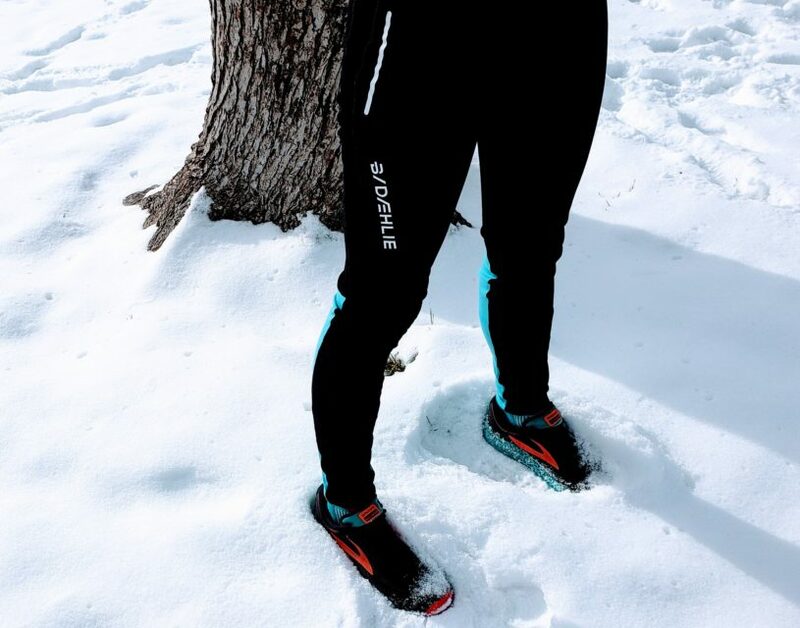 The Winter Tights are made of wool stretch material for the wearer to be warm and comfortable, as well as reflective details for visibility on those dark, winter runs. When I opened the Airnet Wool base layers, I was actually quite excited. However, when I pulled the pants on, they ripped right away. The mesh is a good thought, but not durable at all. The top is actually pretty comfortable — at first, but after a couple of washes, it got really itchy. I like the top more than the bottom layer but wouldn’t recommend either. The Spectrum 3.0 Jacket is a good, durable jacket. 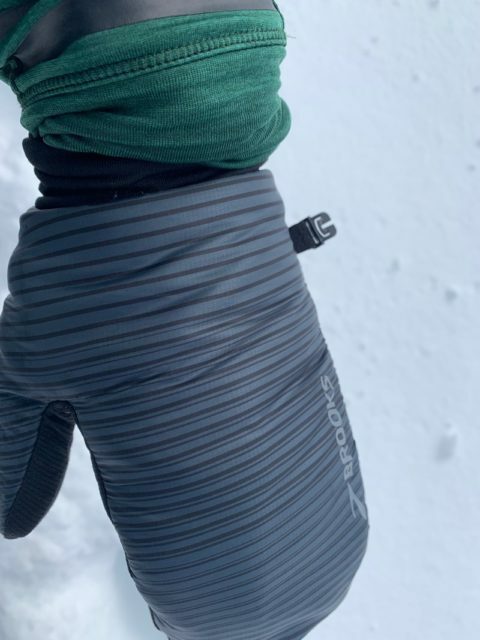 It kept me warm and surprisingly cool during some long, winter runs where I alternated between freezing and sweating, and the fit was actually pretty good. My only complaint would be the quality of the print because, after only a week or so, the lettering started to come off. The tights I did not like at all. I’m not sure if it was the fit or what. They fit fine around the waist but had way too much of an inseam, which made running in them extremely difficult. The wool stretch is a good idea, but not a good combination. This made the tights actually harder to move in. There is a lip just below the knee that I couldn’t figure out exactly what it was for. The description on the site doesn’t say much, but I assume that it’s for the user to tuck the bottom portion in to turn them into capris. I tried this, but it actually just makes them more uncomfortable to wear. 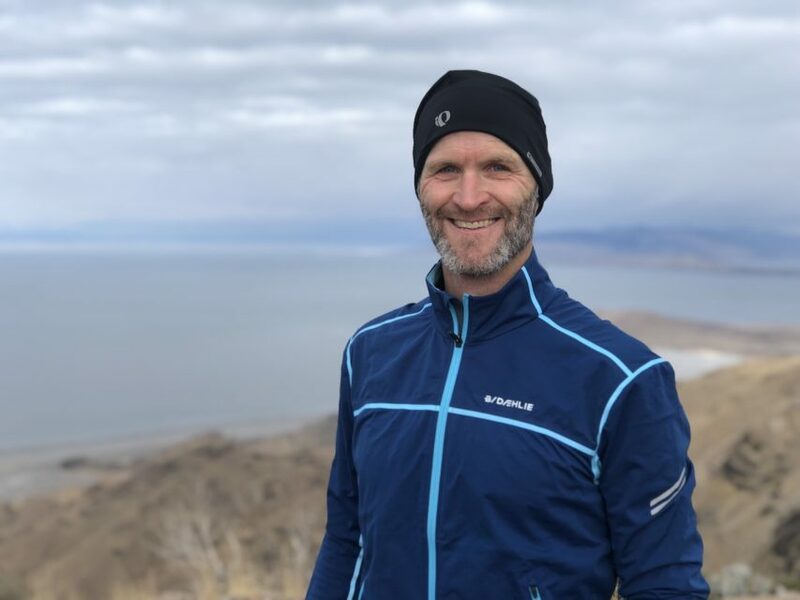 Out of all of the Bjørn Dæhlie products reviewed, I would only recommend the Spectrum 3.0 Jacket. 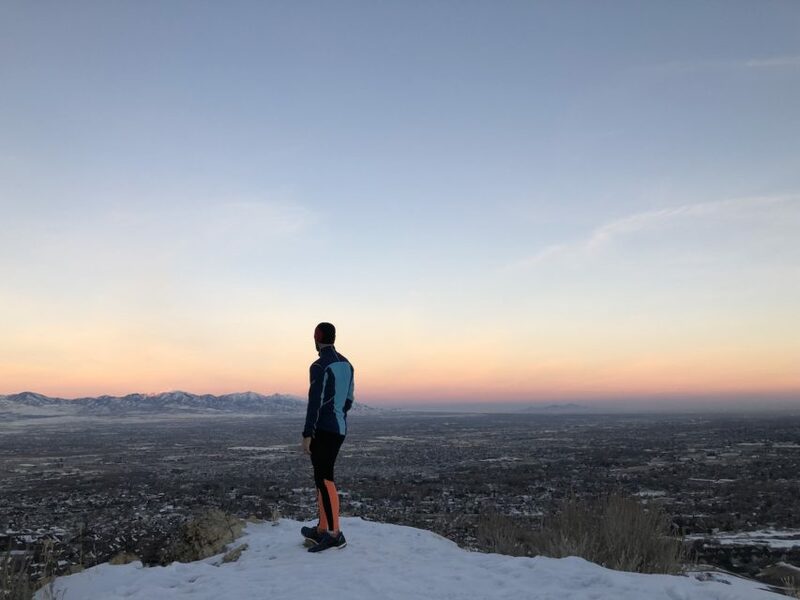 [Craig] I tested the Tights Winter and the Spectrum 3.0 jacket. The Tights Winter (or is it Winter Tights?) 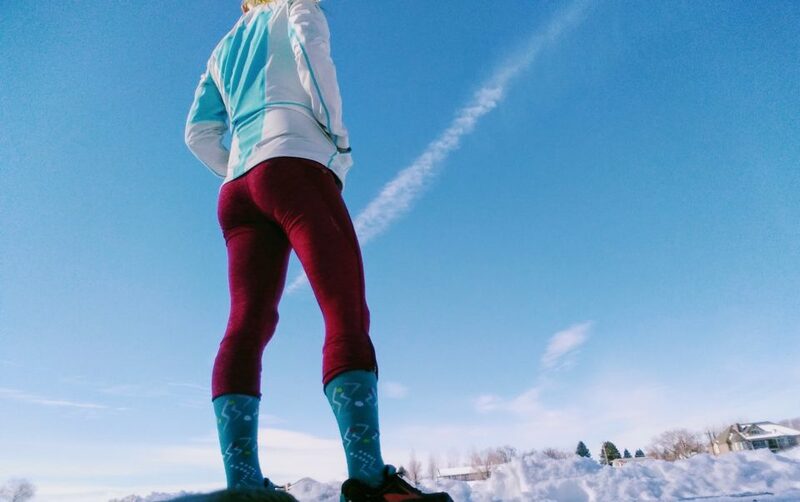 are a two-layer tight specifically designed for high-intensity training in cold weather (less than freezing temps). The front layer, that extends down to the knee, is covered with a thin layer of wind protection, while at the back is a thinner layer of wool fabric, meant to breathe and provide warmth. There are venting panels on the sides of the legs, which help for heat management. 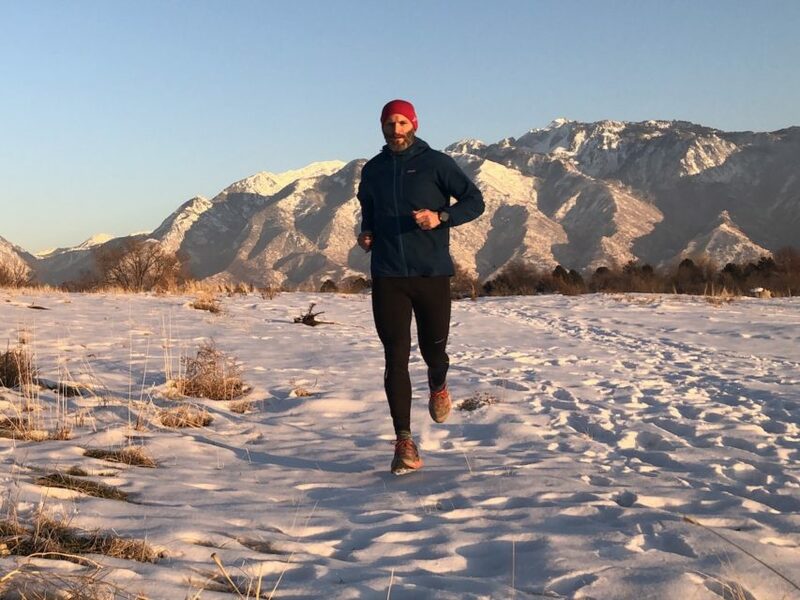 The Spectrum 3.0 jacket is a lightweight cross-country ski and running jacket, specifically designed to provide the perfect balance of warmth, protection, and breathability. The fabric is water resistant, which doesn’t mean it’s a waterproof jacket. It’s our opinion that if there wasn’t so much venting on the back and under the arms, it would probably classify as fully waterproof. That said if there is light rain or snow you won’t have a problem staying dry. The first time I wore this kit I was doing a group run on Black Friday. The forecast was for colder weather, with temps dropping into the 20s. 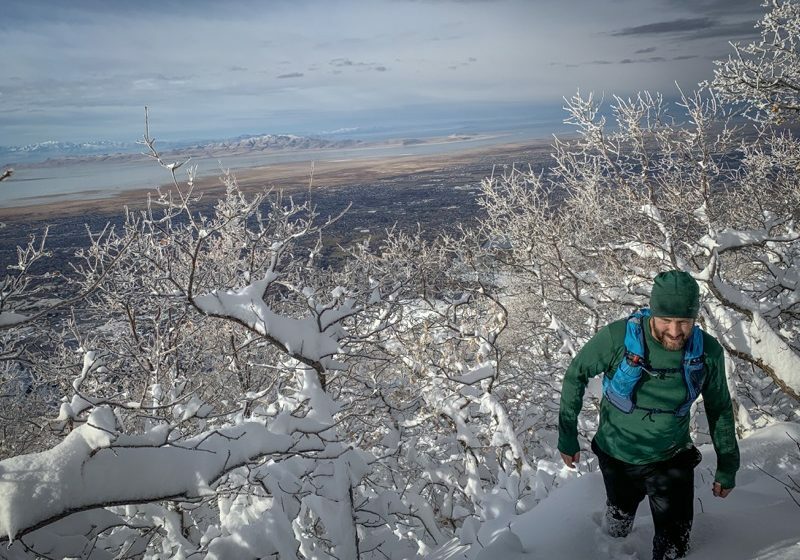 What we actually encountered were temperatures in the mid to upper 30s and a beautiful day for running a mountain on Antelope Island, UT. Needless to say, I was over-dressed. That said, I felt that the tights did a great job of venting the heat from my legs and the jacket provided enough breathability to where I didn’t feel over-heated. Since then I have been smart enough to plan my wearing of both the tights and the jacket on colder days. I prefer to wear them on days when temps range from 5 to 25 degrees F. When I’ve done so (which has been a half dozen times) I can say that the Bjorn Daehlie kit is hands down my favorite thing to wear. It fits perfectly and provides the exact level of warmth and protection I’ve needed. The only draw-back (and you’ll hear me say this again) is that there isn’t a side cell-phone pocket. It’s time brands, every pair of tights (men’s or women’s) should have a cell phone pocket on the side). Other than that I highly recommend both products. 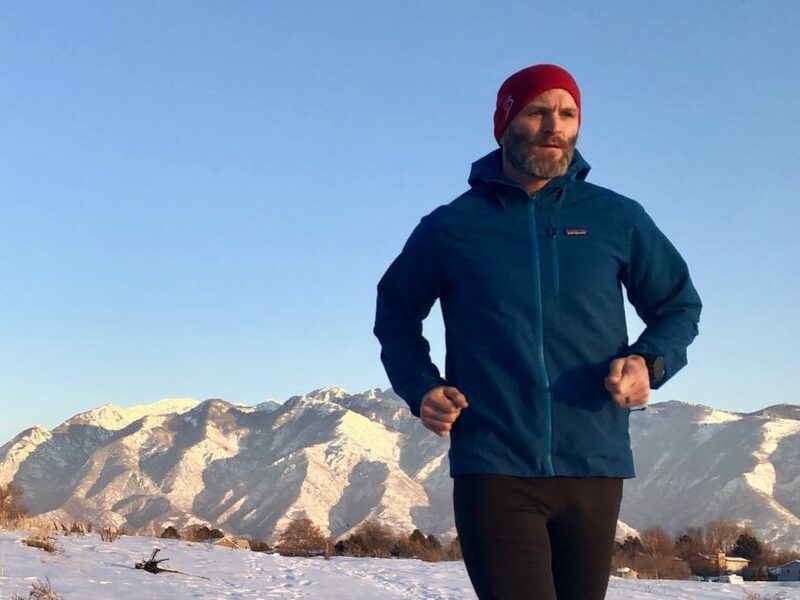 [Craig] I tested the Patagonia Peak Mission Tights and Peak Mission Jacket. The Peak Mission Tights are super comfy, single-layered, and designed for temperatures in the 25-35 degree range. The waistband is quite comfortable and offers and drawstring to lock in the fit. While there isn’t a side cell phone pocket (fail) the rear zip pocket is large enough to fit an iPhone 8+ (just barely), which gives it a partial pass in the cell phone department. The Peak Mission Jacket was created with “strategically hybridized microfleece bonded to an ultralightweight, breathable soft shell for enhanced breathability and warmth during high output.” The jacket works best in colder temps, probably in the 5-25 degree range, which means it doesn’t pair extremely well with the Peak Mission Tights. The fit is contoured perfectly and offers extreme comfort. I’ve worn the tights on several occasions, always on days where temps were in the upper 20s to low 30s. In those conditions, they were extremely comfortable and wore well. I will say that they seemed to fit a bit large, to the point where they almost didn’t feel like tights, as they were loose around the ankles. The bottom line for these tights, there is nothing that stood out to set them apart. They were just your standard tights. The jacket on the other hand, WHOA! The Peak Mission Jacket is hard to wear on runs. Why? Because it’s so damn comfy and good looking, you just want to wear it every day. This is the epitome of comfort, fashion, and performance. I LOVE this jacket, to the point that unless it’s sub-freezing, this is the only layer I wear around town. While I’ve worn it a few times on runs, I find that I’d rather have it fresh and fashionable for everyday use. For those who want something to wear on really cold days, however, you can’t go wrong with the Peak Mission Jacket. It is truly amazing.